This recipe is a bit similar to the Appam recipe I have posted sometime back, but a lot different from the making to the taste. I got this recipe from Deepthy a friend of mine. From then this Appam had been our favorite breakfast/dinner. You really wont know how fast kids finish eating this and you feel so satisfied when they eat well. 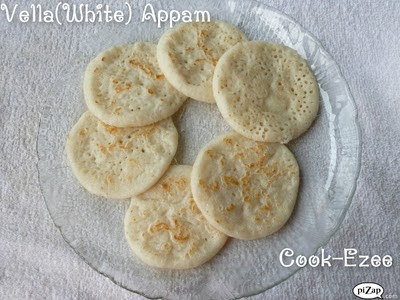 You do not need any particular Appam Vessel for making this, any non-stick griddle or pan works. Also you can make 3-4 appams at a time if you have a pancake griddle or any wide pan. and got to know that they call it Vella Appam or Kallu(Toddy) Appam since it is white in color and originally made with Kallu(Toddy). We were discussing about the other Appam and she said they call that Pal(Milk) Appam since it is made using coconut milk. Hmm ok, enough of the stories I know :). Whatever may be the name the Appam, I just know it really is an awesome Breakfast/Dinner dish. I have tried it with Black Chana(Kadala) Curry, Egg Masala, Chicken curry and felt everything tastes just simply great. 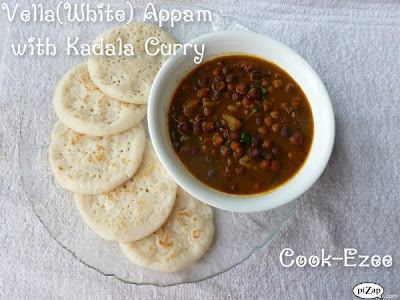 So adding this recipe of Appam for all of you, Enjoy!!!!! Wash the rice well two to three times and soak for at least 5 hrs. Grind the rice and all the ingredients other than yeast to a smooth batter of dosa consistency. Pour into a big bowl, add yeast, sugar, salt and mix well. Set aside in a warm place to ferment overnight or for 6-7 hrs. Heat up non-stick dosa pan or griddle in medium heat and pour a small laddle of batter. Do not spread, close with a lid for few secs or a min. Open the lid and turn the appam and cook for few more secs. Take of the pan. Serve warm with Chana Curry or any curry of your choice. Enjoy!!!! Wash chana dal two to three times and soak it overnight or 7-8 hrs. Heat up a cooker, pour oil and crackle the mustard seeds. Add curry leaves, dry red chilly and stir for few secs. Add the chopped onion, ginger, garlic, salt and stir till onion are translucent. Add tomatoes and saute till tomatoes become soft. Add all the masala powders and stir well to mix. Add the potatoes, soaked chana dal and water(at-least 4 cups or as needed) and close the lid. Pressure cook it in high heat for 1 whistle and simmer the heat to medium and cook it for another 5-6 whistles. Switch off the flame and let it cool. Once the pressure is off, open the cooker and mash few chana and few pieces of potatoes and let it cook in medium flame for another 5-7 mins. Switch off the flame, add few chopped coriander leaves and Serve.. 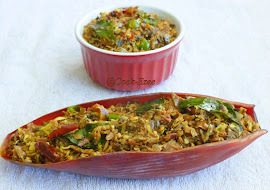 Originally Cumin(Jeera) is grinded with rice, but I have used fennel(perinjeerakam) seeds instead and flavor was great. You can use Jeera or fennel as you wish. 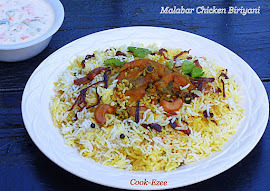 Hi Prathiba,Ur blog luks yumm dear.U have luvly recipes on display. syndabFollowing recipes. @MyKitchen Flavors: Thanks for those sweet words. Happy Cooking!! !